Alex has a neurological disorder that affects his vision, fine motor skills and balance. He was looking for both companionship and assistance from a service dog, and Baylor, fills the bill on both counts. Baylor helps Alex navigate his Seattle world by steering him around obstacles, helping him ride the bus, and giving him reassurance when he is on dark stairways or slippery hills. Alex says his disability can make him feel “blue” sometimes, but Baylor lifts his mood and helps him keep a positive outlook. Barbara says Max means everything to her in her personal and professional life. She works as a Psychiatric Nurse Practitioner on Whidbey Island, WA, with Max as her animal-assisted-therapy dog. Max brings great joy to Barbara’s clients and co-workers. Many of her clients have suffered great losses, and Max knows just when to approach them, resting his head in their laps as the tears stream from their eyes – and Barbara’s. She says Max gives back so much more than she can ever give him, and she is eternally grateful to have him. Barbara was paired with Olivia, a hearing dog, in the summer of 2013. Olivia makes sure Barbara knows when the phone rings, the oven timer goes off, or someone is at the door. But most important, Olivia alerts Barbara to danger signals, like a smoke alarm. That makes Olivia both a potential life saver and a trusted helpmate for this Kingston, WA, resident. Barbara says she has found the perfect match in Olivia and that her life is richer, fuller and safer with the dog in her life. Christopher sustained a severe brain hemorrhage while still in his mother’s womb. His premature birth left him unable to walk, talk or feed himself, and his vision is almost non-existent. But the 8-year-old is a happy little guy whose life was made brighter when he was paired with Campbell. Christopher is cognitively aware, and Campbell helps stimulate his awareness and gives him lots of unconditional love. Christopher’s mother says she has seen a big, positive change in him since he got Campbell. She says Campbell is a blessing to the family and has given them new hope for Christopher’s future. Diana says Hyak has given her new freedom by picking up things she drops, bringing the phone, closing the door and pulling off her jacket, among other things. She said they had a bit of a learning curve, because her cerebral palsy makes it difficult to speak clearly. That meant that while Diana had to learn a new vocabulary associated with handling a service dog, Hyak had to learn to understand Diana. But they have adapted nicely to each other, and Hyak makes it much easier for Diana to be active in her community in Troutdale, OR. Lily is a cheerful 8-year-old who, like other girls her age, loves rocks on the beach, family, coloring and Play- Doh. Unlike most others, she has to live with severe seizures. When she was just four months old, Lily was diagnosed with Porencephaly, which literally means “hole in the brain.” She has had to deal with medication side effects, new diets and anything else that can possibly reduce seizures. Spencer alerts Lily’s parents to a seizure when they are not in the room, and he’s a best friend who brightens Lily’s life. When Steve was 27 years old and on his way to work, some criminals attacked him and left him with a life-threatening Traumatic Brain Injury. He is unable to talk or care for himself. 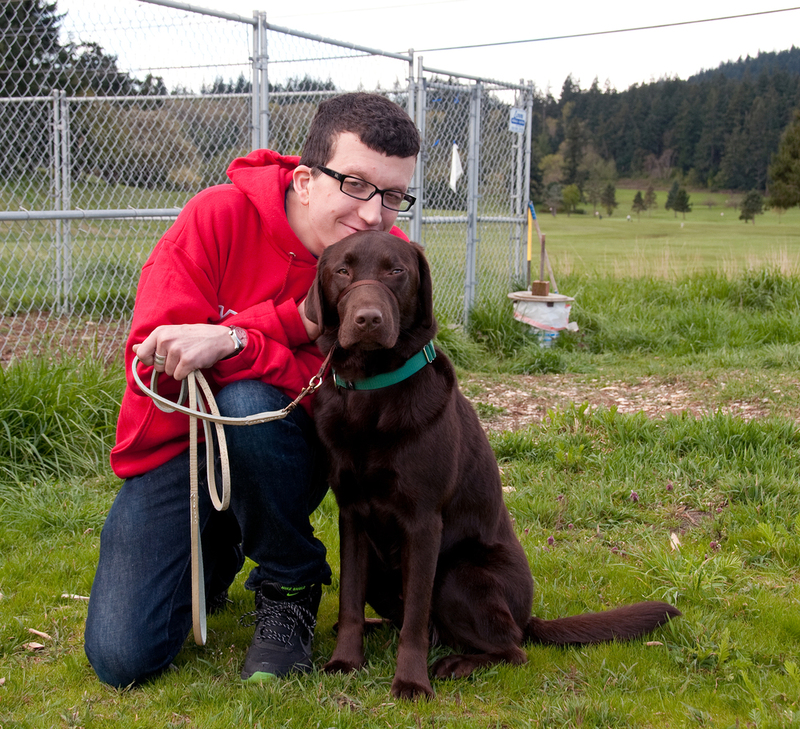 Steve now has a wonderful companion dog, Mario, to encourage him to reach out and interact. Mario gives Steve loyal, trusting company. Steve’s parents hope Mario will motivate Steve to learn and use signals to communicate with his new companion dog. Mario has also turned out to be a wonderful therapy dog for everyone in Steve’s nursing home in Lake Stevens, WA, sharing his love and comfort up and down the halls, as well as with Steve.